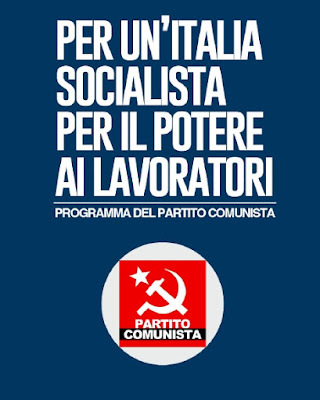 SHORT RESUME OF THE PROGRAM OF THE COMMUNIST PARTY (ITALY) FOR THE ELECTIONS 2018. The program of the Communist Party is not simply an electoral program, it is a program of struggle for the revolutionary transformation of our society into a socialist one. The revolutionary goals, indicated in the Communist Party's program, are not achievable through the participation in bourgeois governments and left or left-centrist coalitions; they are not compatible with the permanence of Italy in the European Union and NATO, that are tools of big monopolistic capital to oppress the workers and the peoples, hijacking the product of their work. There is no third way: either bourgeois power and capitalistic barbarity, or workers' power and socialism! Elections are only one of the existing grounds of struggle. The workers and the people's strata should be aware that the liberation from exploitation, oppression and poverty will not be a gift by anybody, but only the result of their struggle. Therefore, the working class should develop a militant political activity, for politics not to be left in the hands of careerists, political adventures and incompetents, in order to safeguard their interests without granting proxies to anybody, and affirm their central and historical role. A world without workers is not possible, a world with no capitalists is necessary! 1. Minimum wage, established by law, of 10 euros per hour (nearly 1,400 euros monthly after taxes) for all jobs, 11.50 for the most arduous jobs. 2. Reactivation of the sliding wage scale (wage indexation). 3. Reduction of working time to 32 hours weekly at same wage. 4. Abrogation of the labor market reforms by Treu, Biagi and Renzi (Jobs Act). 5. Reinstatement of the 18th Article of the Workers' Statute and its extension to all the companies and work places, regardless to their size. 6. Wage and rights equality between female and male workers. 7. Creation of a Social Quality Certificate, stating the full compliance of the companies with the laws on labor, the National Collective Labor Agreement and the job safety regulations. 8. Ban on the participation of companies without Social Quality Certificate to public tenders and orders. 9. Abrogation of all the previous laws, limiting the freedom of trade union representation, the right to strike, the workers' political and trade union rights in general. 1. All-around implementation of progressive income taxation criteria. 2. Generalized reduction of employed workers' income tax rates until their final abolition. 3. Generalized reduction of indirect taxes and consumption taxes for primary goods until their final abolition. 4. Increase of indirect taxes and consumption taxes for luxury goods. 5. Increase to 20% of the Web Tax rate on the gains, made through the Internet. 6. Reduction of tax rates for small and artisan business. 7. Property taxation of private assets and real estate over 3 millions euros in addition to the taxation of the income given by them. 1. Abrogation of the previous reforming laws of the pension system. 2. Retirement age at 60 for everybody and even earlier for the most arduous jobs. 3. Return of the Severance Pay to the full availability to the worker. 4. Increase of minimal pension [not enough social security payments at the moment of retirement] to 1,300 euros per month. 5. Increase of social pension [no social security payments at the moment of retirement] to 1,000 euros per month. 6. Abolition of “golden pensions” over the cap of 5,000 euros per month. 7. Creation of a National Pension Fund, separated from other social aids funds, funded by the national tax system, in order to link the pension issue to social productivity instead of life expectancy. 1. Free access to healthcare system, qualified and one for all the country. 2. Re-nationalization of all previously privatized healthcare services. 3. Ban to the outsourcing of any medical and healthcare service by public healthcare system. 4. Free access to the education system of any level, from elementary school to university. 5. Free access to sport activities. 6. Guaranteed access to culture at any level, promotion of a qualified cultural offer by creating a National Plan of Culture. 1. Ensuring everybody with the real right to housing. 2. Expropriation without compensation of real estate concentrations, owned by construction companies, big real estate agencies, banks, insurance companies, private families and the Church. 3. Free access to day-care facilities, their redevelopment and increase of number in order to meet the needs of proletarian mothers. 4. Doubling the disability monthly allowance. 1. Italy's exit from the European Union. 2. Italy's exit from the NATO. 3. Closure of all foreign and NATO military bases and restoration of the full territorial sovereignty. 4. Rejection of the TTIP and similar free trade treaties. 5. Withdrawal of the Italian troops from any military mission abroad. 6. Rejection of war as a means of settlement of disputes. 8. Establishing good diplomatic, economic and cultural relations with all friendly countries, wishing to develop relations with Italy on the basis of mutual respect, reciprocity, equality and mutual advantage, particularly promoting friendship and solidarity with socialist countries and countries fighting against imperialism. The implementation of these goals requires means and resources. It is not true that today there are no resources to fund and implement the goals of this program. Today, even in times of economical crisis, the accumulated wealth could allow all the humankind to defeat poverty, famine, diseases, illiteracy, unemployment, etc., and achieve good life standards. It does not happen because wealth is concentrated in the hands of a small bunch of capitalists. According to the Oxfam Annual Report 2017, the richest 8 billionaires in the world own as much wealth as 3.6 billions people, while the richest 1% of the Earth population owns as much wealth as the remaining 99%. In Italy the richest 1% of the population owns 25% of the net wealth, produced in the country. The resources exist, but the private property on the means of production prevents from using them for the development of society and the fulfillment of the working people's needs. Because of this, revolutionary and radical steps must be taken to definitely stop the impoverishment of the working class and the people's strata. 1. Expropriation with no compensation and nationalization of monopolies and big companies of all sectors, including industry, transport, services, trade and distribution. 2. Expropriation with no compensation and nationalization of banks and insurance companies. 3. Expropriation with no compensation and nationalization of big concentration of assets, real estate and land, generating parasitic rent, owned by private families and the Church. 4. Creation of a National Committee for Economic Planning. 5. Implementation of special development plans for modern infrastructuring, national agriculture and renewable clean energies. 6. State monopoly on foreign trade. 7. State monopoly on subsoil and energetic resources. 8. Italy's exit from the Euro monetary system. 10. Cancelation of the Balanced Budget Amendment in the Constitution. Such deep changes in economy can be implemented only if the political power belongs to workers. It is necessary to build the new State as the tool of the working class and the people's strata to fulfill their needs, to implement their revolutionary tasks and goals, to build socialism. For this purpose, a complete break of the bourgeois state is required, definitely burying the illusion it can be improved from inside. Therefore, important steps must be taken, reflecting the change of class in power in the form, the substance and the functioning of the State. 1. A new Constitution, clearly ratifying the workers' power, the process of socialist construction and the social property on nationalized means of production, water, subsoil, energy resources. 2. 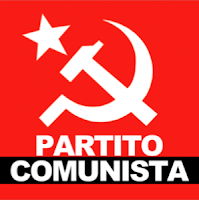 New bodies of representation, endowed with legislative and executive powers, where delegates are elected directly by workers of all categories and sectors on both work place and territorial basis, instead of the bourgeois multiparty parliamentary system. 3. Proportional voting: one head, one vote. 4. Right of revocation of the elected office. 5. Modification of agreements and treaties between the State and the Church to affirm the full separation between them and the secular character of the State. 6. Creation of Workers' Inspection Bodies, elected directly by workers on each work place, to control the implementation of the centralized Economical Plan, quality standards and the application of the regulations on work safety. 7. Revision and amendment of criminal, civil and administrative laws, according to the change of class in power and the new Constitution. 8. Merciless fight against mafia, organized crime and corruption, establishing the immediate confiscation of assets and proceeds, coming from criminal activities or belonging to criminals even if in a legal way.